With some species known as the Californian Lilac, Ceanothus are an excellent evergreen shrub to small tree that grow well in sheltered positions. The popular varieties have brilliant blue flowers, however the genus has more to,offer the landscaper. Wholesale growers offer a range of plants to suit different applications. 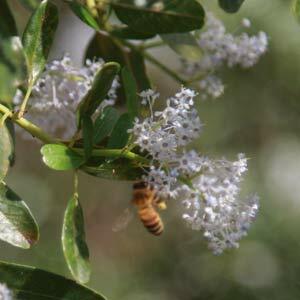 Ceanothus are commonly used as low growing, spreading ground covers, although some varieties can reach to 3m. Most will form rounded shrubs and with a little pruning can make neat landscaping plants. It is the flowers that cover the plant from summer to early autumn that are the main attraction, although the green foliage is good year round. Ceanothus spinosus ‘Redheart’ is pictured, a wonderful Bee attracting plant, however the cultivars such as ‘Trewithen Blue’ do have outstanding flowers. Ceanothus ‘Joyce Coulter’ is a shrubby type. Masses of blue flowers in spring. C. arboreus ‘ Trewithen Blue’ is a larger growing plant suited for use as a hedging plant. C. thyrisiflorus ‘Blue Pacific’ with its glossy green foliage and blue flowers is another worth looking for. C. ‘Blue Cushion’ and C. ‘Yankee Point’ are two more popular varieties. Quick growing, drought tolerant once established and tolerant of both heat and cold. C. thrysiflorus – Small shrub to tree. C. papillosus – Small tree. C. gloriosus – Is a small to medium shrub, excellent in coastal conditions. Look out for Ceanothus ‘Blue Cushion’ Ceanothus ‘Blue Pacific’ Ceanothus ‘Yankee Point all useful for landscaping and in the rock garden.